The AutoPSI-S2000 has been designed for high pressure (2,000 bar or 30,000 psi) dynamic pressure measurement in harsh environments characterized by temperatures up to 300°C, high levels of Electromagnetic and Radio Frequency Interference fields (EMI/RFI), and chemically volatile media. The AutoPSI-S2000 comes with the service lifetime up to 500 million cycles or 3 years (based on a fatique-free fiber optic/metal diaphragm design). The unprecedented sensor lifetime enables continuous monitoring and control of high pressure hydraulic systems. A robust sensor head design with a 1/2-20 thread and tapered sealing surface provides convenient mounting and torquing. The optical fiber is housed in standard 200°C-rated silicone cable or optional flexible metal hose for industrial applications. Permanently attached to this cable is a signal conditioner housing the optics and electronics. 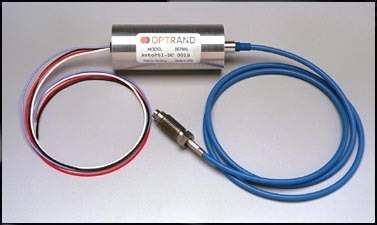 The sensor has an accuracy of ±1% of Full Scale Output over a frequency range of 0.1Hz to 15kHz. A standard output voltage of 0.5V to 5V is provided, with different output values available. The sensor requires a 9V to 18V DC power supply. Signal Conditioner Diam 1.125" x 3.25"